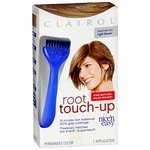 I used this when I decided I wanted to dye all my hair a wild color one summer fresh out of highschool. The bleaching process was okay, but applying the actual color got a bit messy. Other than that, though, the product was pretty self-explanatory and easy to use. And the color lasted FOREVER. Even the next year when I went to have my hair professionally done, there were still some pretty prominent streaks of pink in my hair. I have used many of the different Splat color, as I love this brand. Using the bleach first will give you the most vibrant color. However, I have also used just the color for touch ups. From what I have researched, if you seal the color bottle well so it doesn't dry out you can use it over and over. I have done this and although It does not stay as long as when you bleach it, it still helps to touch up. Of all the colors I have used, the pink has stayed in the longest, by far. And if you are looking for bold colors then this is a great product. The only negative I have, is that it will stain everything and it is hard to get out. I have a few tshirts I just use for dyeing my hair. And I have learned to cover everything around me, like bathroom sink, etc. I have used several different Splat colors and although the pink lasted the longest, I have not been disappointed with any of the colors. 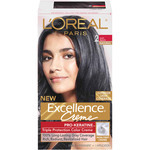 And compared to other bleaches you use in kits, I find that this one is slightly gentler opn hair. Very pleased with the results! Color stuck around a while! 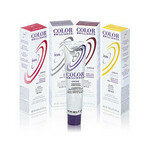 I love to color my hair using Splat hair coloring kits. The kits are easy to use (it comes with bleach!!) and the color DOES LAST, as long as you rinse with cool water, wash 1-2 times a week, and avoid heat (there's a ton of tips out there). Joico Red Sham/Cond. helped very well, in that it made my pink hair look "sharper." Super bright vibrant colors and choice. Last forever. If you get it on your skin it scalp it stains badly and last forever. Also kind of drips when you're sweating for the first few days. Color remover from your local beauty shop helped me the most to remove it. The blue was super hard to remove when I wanted to change to a new color. 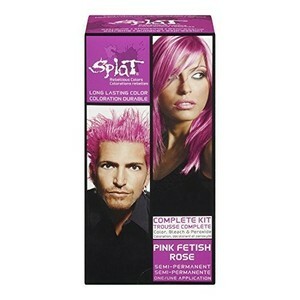 I still continue to use splat for my bright hair colors. 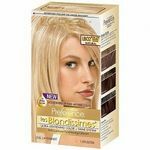 I have used almost all the splat for brunette colors. I used this product just to try something different without going permanent. 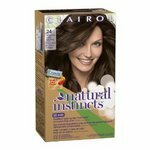 I loved the color and it lasted 10 shampoos. Great product!